Indeterminate from the scriptures. I have set the scene at sunset. Main light comes from the setting sun, in the west, which is left of this scene. Glow from candles, torches, fires in the city of Nineveh provide other light, as does the rising red moon. Jonah & his new friend the crab! Various people in the distance going into & out of the main gate of the city of Nineveh. Google Earth position & orientation 36°21’33.56” N 43°09’09.60” E Looking ENE towards 2 mountains. The peak on the left has no name that I am able to find. It stands behind 2 lower, closer peaks that do have names: Jabel Bashiqah & Jabel Maqlub. 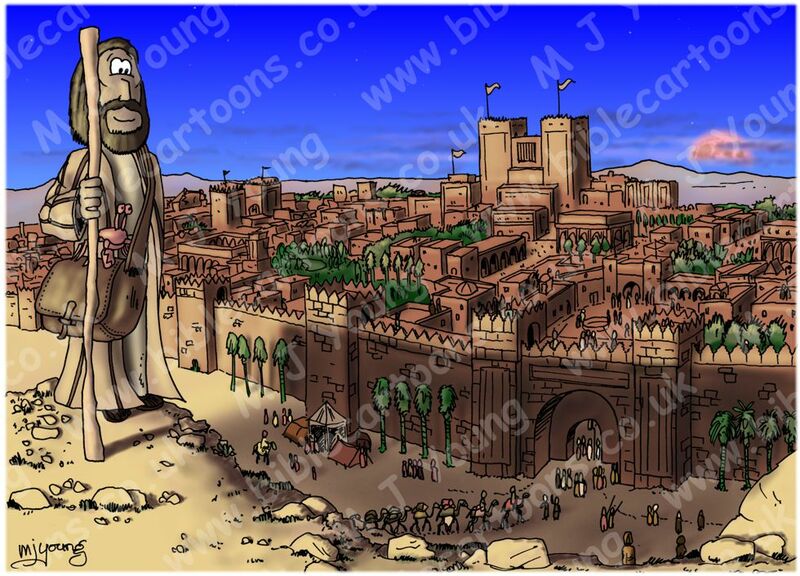 On the right of the cartoon stands Jabal Ayn as Safrah. I found some photographs of the area around Nineveh on the internet (Panoramio – a photo sharing program) which helped inform me of the colour & nature of the local rocks & othern landscape features & their colours. 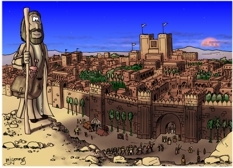 Assyrian defensive walls are depicted as having stepped crenellations on top of their formidable height. This is certainly quite a different architectural style to the Hebrew.